"He flew in from Mo. 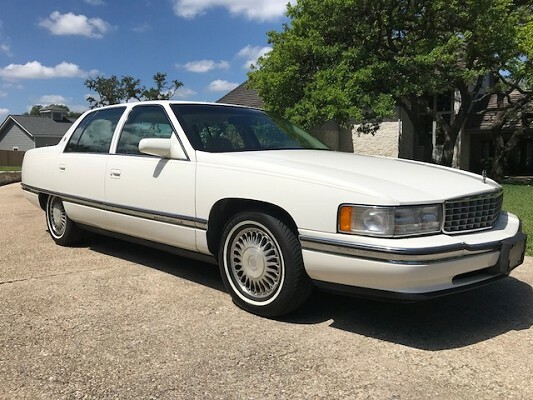 and drove her all the way home"
1995 Cadillac Sedan Deville, One owner car garage kept, up to date on maintenance records and always a southern car. 49,739 original miles. 4.9L v8 engine, automatic transmission, power steering, power disc brakes all around, A/C blows real cold, Factory digital dash, Factory Bose Premium sound system, AM/FM/Cass player w/built in EQ. Original premium beige leather interior, headliner and carpet are in great shape. Power windows, mirrors, door locks, window locks, both front seats and power trunk lock. Clean car inside and out. Perfect first time driver or get it ready for the shows. Come drive this car you will not be disappointed.